Flying Lotus probably cares as much about Record Store Day as the next music junkie, but that's not the biggest event he has circled on his calendar this month. That special day will be April 20, the international day for marijuana enthusiasts to, well, do what they do every other day. 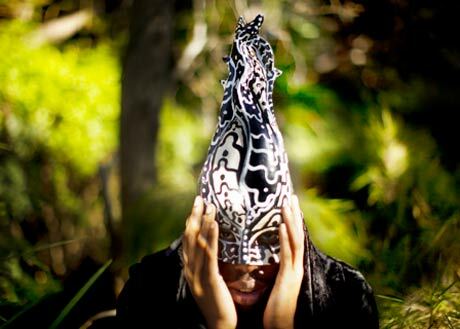 To celebrate, however, Flying Lotus announced a special radio broadcast. On April 20, at 3 p.m. EST, Flying Lotus will team up with much of his Brainfeeder crew for a special broadcast from L.A.'s Dublab studios. The session will begin with Lotus spinning cuts from his upcoming Cosmogramma album, and might include appearances from Brainfeeder stars like the Gaslamp Killer and Daedalus, among others. And, hey, maybe if we're really lucky that Thom Yorke fellow will swing by. The broadcast will be available here, and a press release urges listeners to "enjoy the broadcast in a way fitting for the occasion." Once you're tripping balls, FlyLo wants you to take a break and head over to Bleep.com. If you pre-order Cosmogramma on 4/20 from that site, you'll receive an exclusive hand-stamped art print of a piece called "Sketch Head" that was drawn by Flying Lotus himself. Better yet, one lucky pre-order will be shipped with the original watercolour piece. Cosmogramma will be released on May 4 by Warp Records, and believe us, it lives up to the hype.